When I asked you all for light, fluffy reads last week, Shannon of River City Reading recommended I check out Where'd You Go, Bernadette. I wasn't able to get to the library again before leaving, but, as luck would have it, my grandparents have a small library in their condominium. (If I haven't mentioned before, my grandparents live in a 55+ community in Sarasota—if you know anything about Florida, you will find this entirely predictable.) Where'd You Go was lying on the top of one of the stacks, and I snapped it up immediately for a poolside read. I wolfed the entire thing down in just over 30 hours. This is the story of a family—Elgie, Bernadette and their daughter, Bee, who is about to graduate from middle school with flying colors and wants to celebrate. The moment she requests a family trip to Antarctica, she sends her agoraphobic, socially-avoidant mother into a tailspin, one that (as the title suggests) results in her disappearance from their home in Seattle, Washington. Bee decides to hunt her mother down, piecing together the days before she left through faxes, emails and police reports, and learns much more than expected about her family and (cheesily) herself along the way. My quibbles with this book are minor. I would normally complain about the characters' cluelessness and my failure to relate to them (most, if not all, are exceedingly wealthy and think their money grants them invincibility), but it really worked here, and the story wouldn't have been the same without it. Some more fleshing out of certain characters would have been nice, but, again, this book worked just the way it was. I would highly recommend this book to anyone looking for a day-long escape into the drama (both serious and not) of someone else's family. We can all use that over the holidays, right? 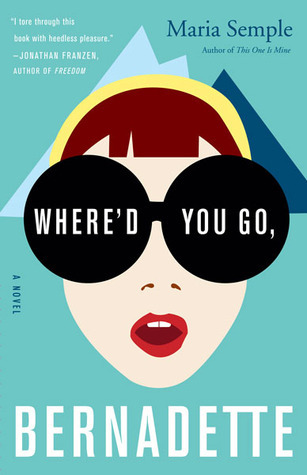 If anyone else has read Where'd You Go, Bernadette, I'd love to hear your thoughts! I am too—thank you again for the rec! My thoughts were pretty similar to yours. I had to recommended to me as being laugh out loud funny and while parts were funny it didn't reach that level for me. That being said, I did really enjoy it. Something about the characters, the writing, the format and the plot just really worked for me. I just noticed my library has it in audio and while I wouldn't do a reread of it I'm seriously considering listening to it. Oh my, I bet an audio version of this story would increase the laughs exponentially! Do you know who does the audio version of it? And same here on the book just clicking. I don't think I'd enjoy many other books in a similar vein, but this one really did work! It was so great! You'll definitely dig it if you like the epistolary style. It really works here and contributed a great deal to my enjoyment of the book.